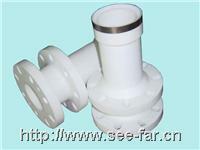 There are two types of PTFE rod. The rod with diameter of 49mm is made by paste extrusion of dispersion polymerized PTFE resin; There are two kinds of PTFE rods to offer.One is made by ram extruding method is the diameter form 10~50mm;rods over the diameter 50mm are manufactured by moulding. PTFE has a wide range of practicable temperature from -180+260 and a wax-like surface to which anything hardly sticks.PTFE has the lowest coefficieng of friction of all known solid materials.It has the best electrical properties of all plastics.